This is the first book in a new series from the author (well new series for me). It is a typical storyline that she turned into a good read. I thought this was as such a fun treat to read. It is irreverent, charming, moody, and yet so addictive!! 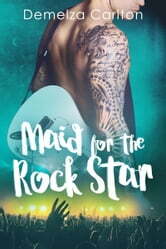 Hard to resist reading about a bad boy rock star with an incredibly hot and hard body. I was intrigued from the first chapter and had trouble putting it down. What a great start to the Romance Island Resort series. ***This copy was given in exchange for an honest review. Really enjoyed this book. Loved the bad boy rock star. The characters are hot and honestly, couldn't put it down. Can't wait to read the rest!!! I Can't Wait To Read More from Demelza Carlton! This is a very entertaining read and a very good introduction to the series. I am looking forward to finding out what happened between Jay & Audra.